Looking for great new seafood spots in Seattle? You probably want to head to our neighbor to the north. Oh, Canada! Here in Seattle, we’ve always loved you, our neighbor to the north — but we used to find you a little comical, it’s true. Your ways were so quaint: your maple syrup, your Mounties, your funny pronunciation of just a few words. Most-likely-to-be-visited Vancouver didn’t have what you’d call an urbane feel — time-travel back just a decade, and aside from the dubious nightclubs of Granville and some dowdy pubs, the streets rolled up long before midnight. 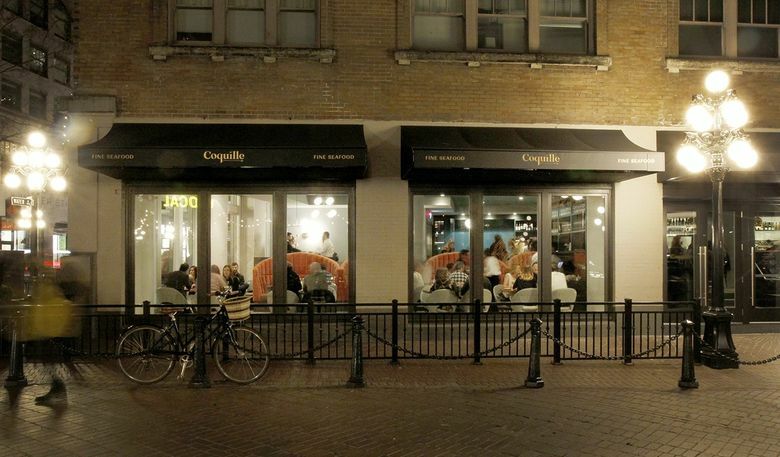 Excepting a handful of outliers, restaurants were not your forte. We didn’t make fun of you. You’re so nice, how could we? But we felt a bit superior, more worldly. We may have referred to you, privately, as America’s Hat. Today, the shoe is so far on the other foot, we don’t even have a shoe. You have your kindness, your progressiveness, your handsome (and kind, and progressive) prime minister. We have … now is not the time. But you are the place, now, that we want to be. A visit to Vancouver feels different these days, and not just because it’s become a gorgeous, global gourmand’s city. When we come up, we’re delighted to see your craft cocktail scene now rivals the best of the U.S., because we could really use a drink. 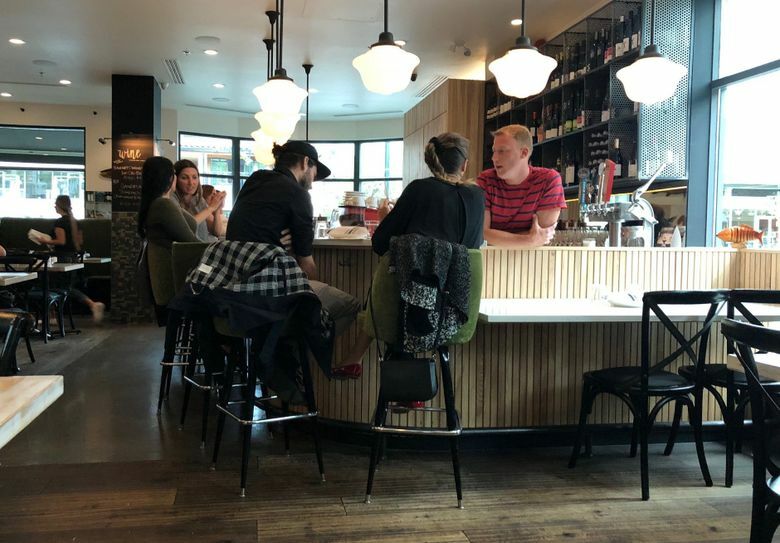 And while Seattle’s been getting new restaurants right and left — at last count, 46 in six weeks — those places are starting to look much the same, with restaurant groups foisting yet another edition of their proven formula on the city, more counter-service spots, more burgers/barbecue/doughnuts/pizza. (So much pizza!) Unlike — better than — Seattle, Vancouver has a new school of seafood restaurants, places that avoid the fish-house cliches in different, marvelous ways. A quick trip to a kinder, more forward-thinking foreign land to eat a lot of great seafood is a tremendous solace right now, Canada. Thanks. The prices here, which already seem reasonable, are in Canadian dollars; you may currently acquire one for $.76 American. Do you mind if we stay? If you’re staying downtown, consider strolling to Oddfish — your route will likely span the art deco Burrard Bridge, guarded by lions’ heads, bedecked with boats, proclaiming “BY SEA AND LAND WE PROSPER.” And you shall especially prosper by the sea at Oddfish — it opened about a year ago, from a group that owns a few neighborhood Italian places. Upon arrival, we happened to be greeted by someone who used to live in Seattle; he said that he loved Vancouver, and that when he moved, he felt like a huge weight had been lifted off his shoulders — one he hadn’t even realized was there. Given a corner of a moss-green banquette in a little eddy of the not-too-big, not-too-small room, we started to feel the same way, especially after supplied with cocktails (listed under “ODD IDEAS” — quaint!). A dangerously drinkable Yuki’s rum punch ($12) was made with citrus, Campari and añejo Havana Club rum from Cuba (can’t get that in the USA), while a rosemary Collins ($13) tasted fresh and balanced, rather than like shrubbery. The buzzy room was full with a crowd that felt like happy neighbors, while details like curved blond wood and French schoolhouse fixtures felt just right. For a virtuous dish, sweet green snap peas matched with pretty, pink, peppery radish and mint ($15) was very good without being goody-goody, due to liberal use of butter. 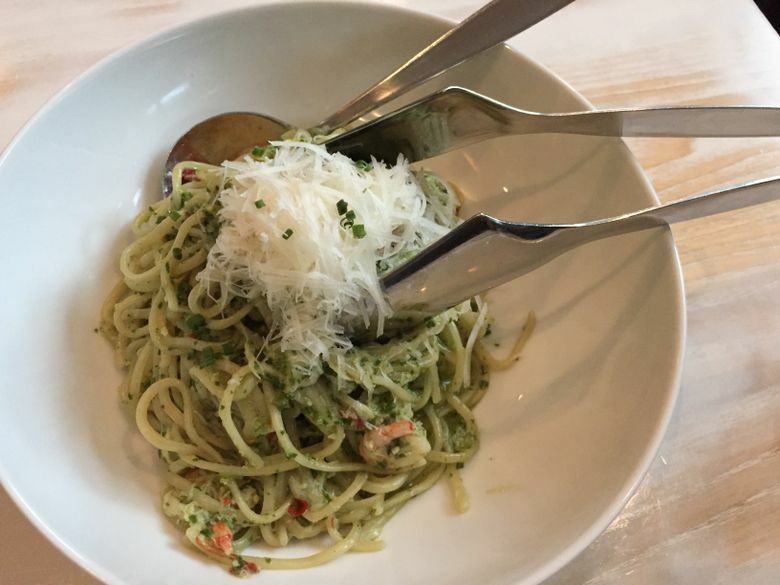 Housemade linguine — served, prosperously, with pesto by land and both shrimp and Dungeness crab by sea ($35) — approached the ethereal thinness of angel hair, but retained a perfect slight resistance to the bite. 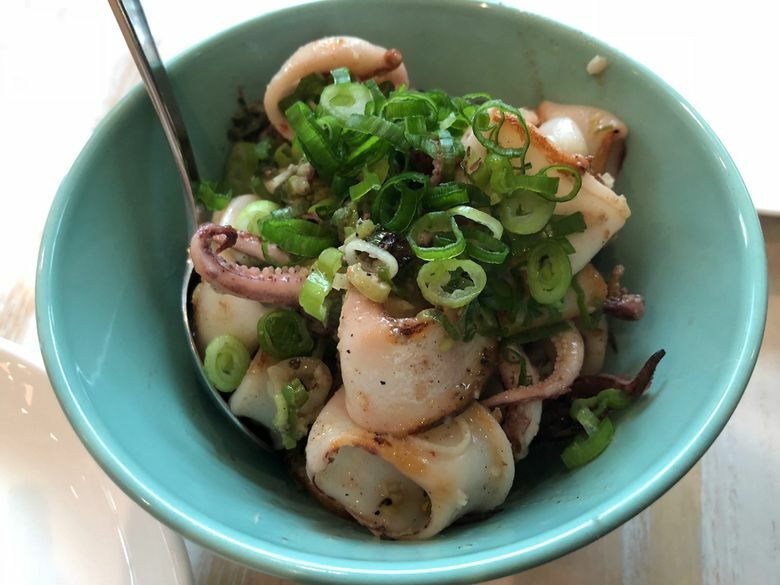 And Oddfish’s “Spicy Squid | chiles | garlic | onion” ($18) proved to be the favorite (or “favourite”) of the entire weekend: ideally spicy, tremendously tender, citrusy-bright, augmented with crunches of green onion. The squid gets a 24-hour brine, then a blanch, then a little time on the plancha, said our kind and efficient server. Surprisingly, it came from New Jersey — while not insistent on local sourcing, Oddfish is certified a sustainable choice by Ocean Wise. Too full for dessert, we walked back across the bridge, the sun setting in glorious streaks on the benign Canadian empire. With its glorious English Bay view and plentiful outdoor seating, Hook Seabar would be a natural sunset dinner-date choice, but we stopped in for brunch. I also had supper here with friends and kids a few months back, for which it was also a great choice. The interior is unintimidatingly contemporary, clean-lined and nodding to nautical, with navy-blue leather chairs; some of the light bulbs are caught, like good ideas, in netting-baskets overhead. A readerboard sign in the bar read “YOU’RE NOT A TRUE CANADIAN UNTIL YOU APOLOGIZE FOR SAYING SORRY.” In Canada, they double-down on civility (and say “sorry,” sweetly, soar-ee). A civil vacation brunch calls for cocktails, and Hook courteously extends special prices for their on-tap ones, like a more limey, less minty mojito ($9). The happy novelty of a Pimm’s-and-gin slushy ($13) wasn’t too sweet (and started out thick enough to eat with a fork, which was fun). Hook’s wide-ranging menu has way more bright ideas and much better execution than a tourist-friendly spot requires. 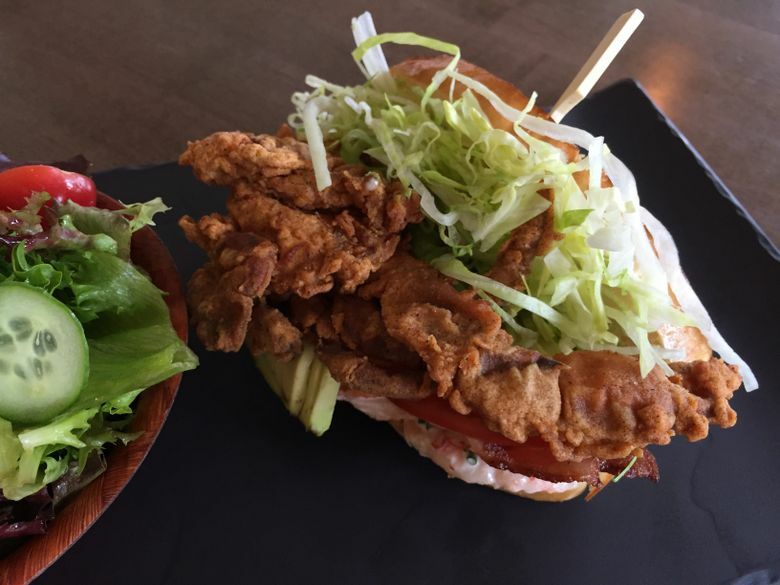 Witness the soft-shell crab BLT ($18, at lunch/brunch and dinner): extremely messy and very worth it, super-crunchy, optimally savory and also, somehow, light. You probably shouldn’t come here without trying the lobster guacamole ($16, all day), which is lush and creamy and actually makes sense, without the lobster getting lost in the mix. More limey-tasting guacamole made another smart choice for brunchtime avocado toast ($14) topped with chilled crab and prawn, plus poached eggs. 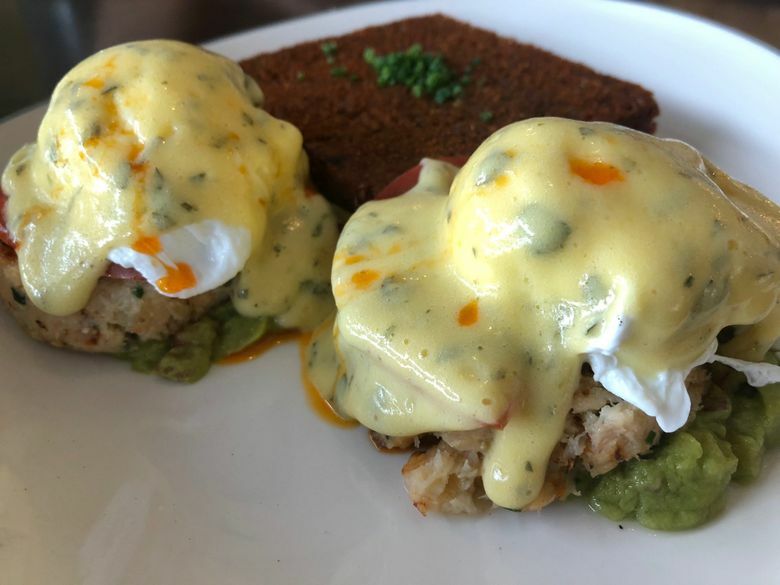 You’ll need to love tarragon to like the Hook benedict ($19), but its accompanying potato-cake, super-crisped on top and bottom, is everyone’s friend. Suppertime at Hook brings the likes of simple-sounding seared salmon, served with intriguing beet crème fraîche ($28). For that unfortunate person in your party who hates fish, there’s New York strip steak ($34) — or a bacon-cheddar burger ($19), also available all day. Aside from the fact that some, but not all, of the fish gets the sustainability stamp, the menu here just seems smart: making everyone feel at home, while adding flourishes of extra goodness everywhere. We could use more of this in the USA. Satoshi Makise opened his tiny, unpretentious jewel of a spot — a three-seat sushi bar, five two-tops and a whiteboard explaining his chef’s choice options — last year. Make a reservation for the bar seats, and you might end up having your initial courses at a table anyway, but it’s worth the wait for an audience. Makise is extremely nice, and he’ll happily share his immigration tale of coming to Vancouver from Osaka at 22; he started working at a Japanese restaurant, he laughs, because he didn’t speak English. Omakase here is $45 for four courses, yet also more — our first one included three kinds of appetizers, including tender grilled black cod brushed gently with a sweet glaze; a slice of delicately layered, famously difficult-to-make Japanese omelet with unagi; and bluefin tataki with a bit of a wasabi kick. The sushi course includes three pieces of chef’s choice nigiri, like golden eye snapper that Makise scores with a surgeon’s precision, then carefully sears to just-buttery; or minerally yet luxurious yellow jack; or viscous-rich cuttlefish with a pinch of shiso; or seared Spanish mackerel with onion-and-dashi jam dabbed on top, and a smokey-metallic flavor like a fish’s gun. Then there might be inaniwa udon, pale, delicate and flat, served hot or cold for dipping. Then there’s ice cream. You can upgrade to five pieces of nigiri for $54.25 total or seven for $62.25 — given how much this kind of care and quality would cost you at home, why the hell not? And yes, this is in Canadian currency, so even more absurdly reasonable. Note that Makise only uses fish from Japan, and he does not concern himself with sustainability — in Canada, once in a blue moon, it’s just maybe okay. I am in love with Coquille. New at the beginning of the year, it’s the seafood sister to Vancouver’s famous L’Abattoir, ensconced in the historic Gastown district. Inside, it’s sleek, with modern mermaid shades of sea-green-blue and peachy-orange; five deep-cupped, shell-shaped, velvety-upholstered booths await for sitting pretty. There are stylized neo-French-brasserie light fixtures, a gorgeously subtle scale-patterned floor, and an aquamarine ceiling inset. The soundtrack might be old American soul. It’s such a pretty restaurant, it looks like Venus might step out of her shell (“coquille” is French for shell), put on some clothes and come have lunch here. The solo lunch I had a few months back included a crisp-but-rich glass (okay, two) of the house-label Okanagan Valley semillon and the loveliest crab-and-shimp Louie ever ($26). The latter featured bountiful, delicate seafood; superlatively crisp iceberg and butter lettuce; bright-yolked soft-boiled egg; avocado; and, cleverly, a creamy-spicy Louie dressing underneath, plus a light application of vinaigrette and tiny mild chives on top. I would eat this every day if I could, but be warned, it wasn’t on the menu recently. Dinner at Coquille was delicious. Hamachi crudo ($18) came with Thai-style crispy bits of shallot and an umami-rich, mint-and-cilantro kissed vinaigrette that could’ve, maybe should’ve, overwhelmed the cool fish, yet somehow didn’t. A roasted whole rockfish ($36) was a snowy-fleshed beauty, lightly dressed with salsa verde and surrounded by tender artichokes. Bouillabaisse ($29) proved a perfected version of a fish-house workhorse: the broth had both depth and delicacy, the fish and shellfish tasted superbly fresh, and croutons wearing herby rouille made a splendid update. Local, sustainable, mostly seasonal seafood is a matter of course here. Everyone seemed to be ordering the banana cream pie ($10). When in Vancouver …? It was truly outstanding — possessed of a layer of intact banana slices, it was tropical-tasting but not oversweet, fluffy and fabulous. It made me think about banana in a whole new way. I’m going to ask them for the recipe. Food writer Alexandra Gill of The Globe and Mail emailed especially to recommend this place, but it’s so brand-new, it opened after my trip to Vancouver. I’m ready to go back to try it right now. An open-air, counter-service affair, it’s made up of repurposed shipping containers lodged on Granville Island; online previews say it faces False Creek and downtown Vancouver, bandying about stuff like “best view.” It’s the work of an all-star squad of the city’s chefs — Angus An, Robert Belcham, Hamid Salimian, and Joël Watanabe — and they’re reportedly taking an American dream approach, making the greatest possible versions of all their favorites — from fried chicken to falafel to lobster rolls — emphasizing health and sustainability, at fast-food-ish speed and prices. Located where, as they say, “the best ingredients in the province are gathered daily,” seafood will be big here, and the photo of a tray of Dungeness, shrimp, lobster and more on their website makes me want to climb through my computer into Canada. But, then, pretty much everything I see on my computer makes me want to climb through it into Canada.